Germany's Thomas Mueller struck twice as the nervy world champions kicked off their Euro 2016 qualifying campaign with a 2-1 victory over Scotland on Sunday. Mueller, who also struck the post in stoppage time when Scotland had Charlie Mulgrew sent off for a second booking, scored with a header in the 18th minute of a first half in which the hosts crafted chances galore. Speedy Ikechi Anya stunned the hosts with a superb finish in the 66th minute but Mueller restored Germany's fragile lead with a scruffy effort four minutes later following a corner. The result puts Germany on three points in Group D along with Poland who thrashed newcomers Gibralter and Ireland who snatched victory in Georgia. "I am satisfied with the three points," coach Joachim Loew told reporters. "It was clear the Scots had nothing to lose. I knew it would be tough after the World Cup, and we were also missing a lot of players." For Scotland, unbeaten in their previous six games, it was bitter to leave empty-handed after playing with plenty of endeavour, especially in the second half when they had Germany flustered at times. In their first competitive game since the July 13 World Cup final in Brazil, Germany, missing more than half a dozen players including Bastian Schweinsteiger and Mesut Ozil, got their first real chance when Mueller met a cross but headed wastefully wide in the eighth minute. Germany showed defensive weaknesses, as they had done in their 4-2 loss to Argentina in a friendly on Wednesday, with Barry Bannan going close for the visitors. The hosts, who had Mario Goetze deployed as a striker instead of Mario Gomez, broke the deadlock when Mueller's arcing header from a Sebastian Rudy volley beat keeper David Marshall. The goal settled German nerves as they tightened their grip on the game with more than 70 percent possession in the first half to keep the Scots firmly on the back foot. Marshall did well to parry a Marco Reus shot as Germany upped the pressure. Reus, outstanding throughout, suffered more bad luck after his injury a day before the World Cup departure that saw him miss the tournament, when he limped off the pitch. 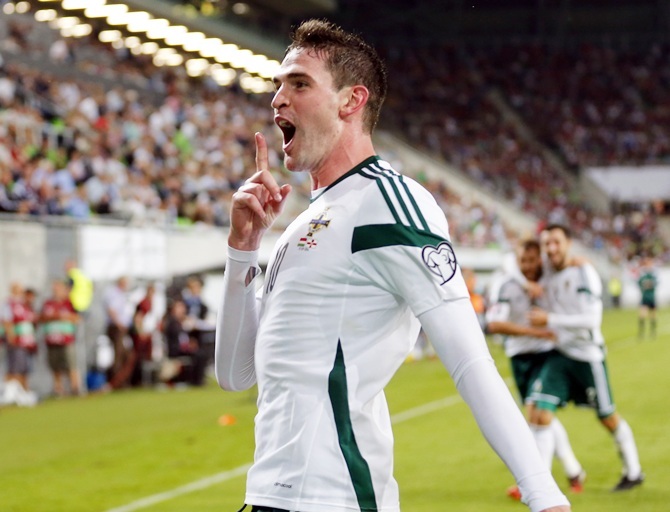 Kyle Lafferty's late goal gave Northern Ireland their first competitive away win since 2010 on Sunday as they scored twice in the final 10 minutes to beat Hungary 2-1 in their opening Euro 2016 Group F qualifier. Hungary appeared to be heading for victory when Balazs Dzsudzsak's vicious inswinging corner was nodded in by substitute Tamas Priskin in the 75th minute. The visitor's response was emphatic with substitute Niall McGinn tapping the ball into the empty net six minutes later after fine work by Lafferty. The 26-year-old Lafferty then grabbed the winner when he was first to react to bundle in a loose ball after McGinn's dangerous cross. Claudio Ranieri suffered defeat in his first competitive match in charge of Greece as 10-man Romania overcame the Italian's team 1-0 in their Euro 2016 Group F qualifying opener in Athens on Sunday. Ciprian Marica's 10th-minute penalty put the Romanians ahead inside an eerily silent Georgios Karaiskakis stadium, with 2004 champions Greece playing behind closed doors after being punished for previous crowd disturbances. The Romania skipper was then dismissed in the 54th minute after picking up a second booking for a high challenge on Andreas Samaris, but a disappointing Greece struggledto create chances even with the extra player. The attacking triumvirate of Kostas Mitroglou, Giorgos Samaras and newly-appointed captain Dimitris Salpingidis failed to trouble a Romanian backline that Greece had comfortably dispatched almost 10 months ago. In the play-offs for the World Cup, the Greeks had secured their trip to Brazil 4-2 on aggregate. Vassilis Torosidis came closest to levelling the match, the Roma defender heading a free kick from Panagiotis Kone against the crossbar with three minutes left.